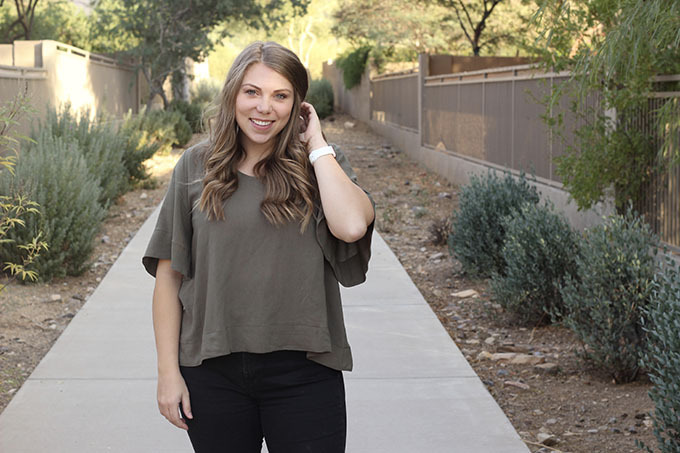 If you're a fan of the loose, flowy, feminine blouse and all aboard the year of the sleeve train, then I've found another fabulous pattern to add to your favorites list with this Sirocco Top and Dress from Coffee and Thread. Until now Olga, the designer behind Coffee and Thread, has done kids patterns and my girl and I have been fans for a long time. So to see her jump into the world of women's patterns made my heart happy and there's no doubt she has plenty to offer as you can see with this first release. 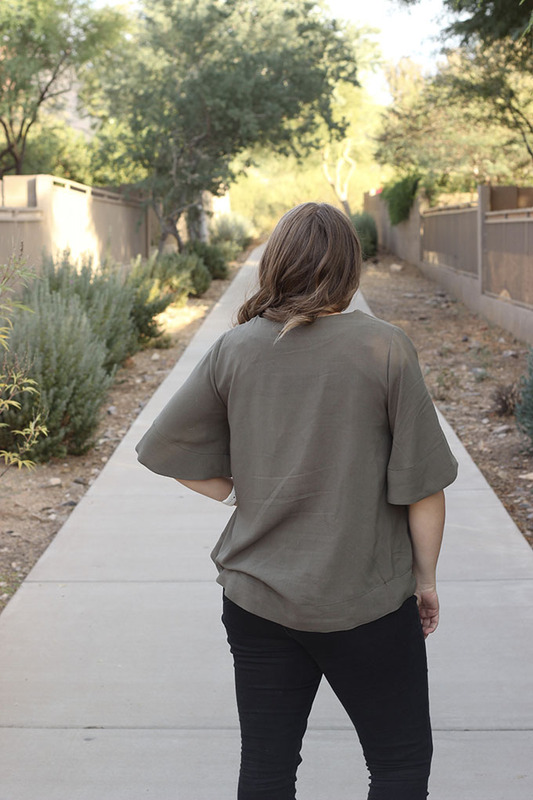 Sirocco is loose and flowy with bell sleeves that hit at the elbow. It comes in two lengths - a shorter top with a high low hem, and a dress that hits above the knee. 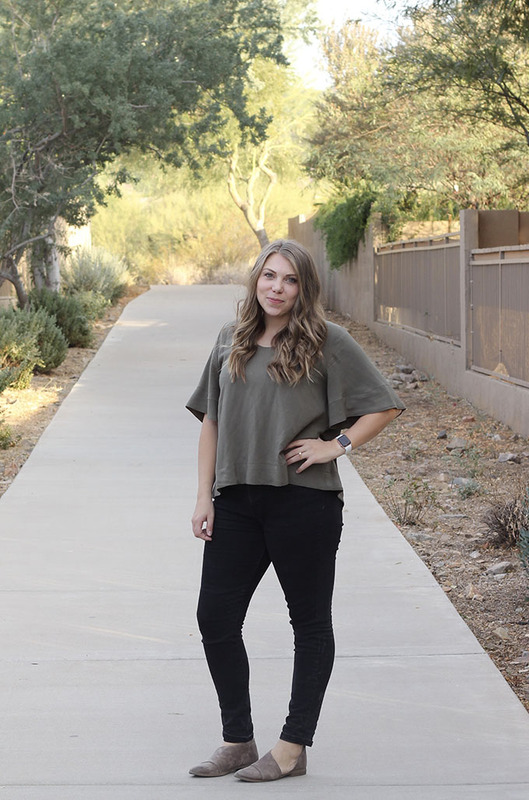 It pairs great with skinnies or a pencil skirt, and can even be layered over a turtle neck for colder weather! I need to make a dress version and wear it with tights and booties for a perfect girls night out dress in winter! It has no closures, just still it on over your head, which makes for easy sewing - anyone can do it! Its also got a beautiful finish with deep facings at the hem, sleeves, and neck. They provide a fun way to embellish your garment with a special fabric popping out which I think would be really cute. For mine I added 1/2 inch in length to the bodice (I'm 5'8" for reference) and it hits mid rise. 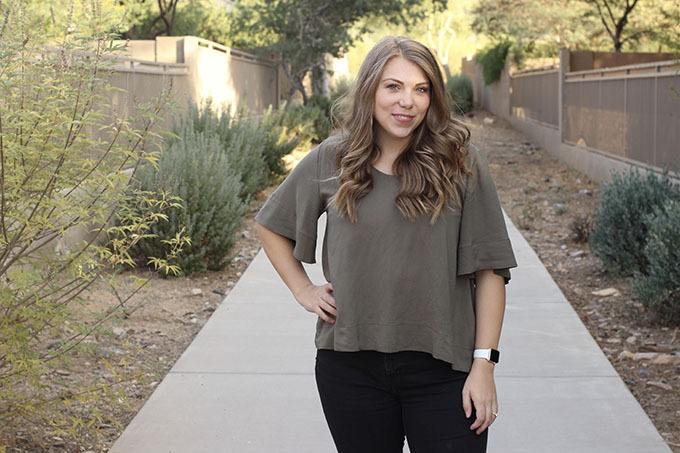 The length is incredibly flattering for this shape of blouse. If it were too long it would resemble a tent, too short and it would be hard for me to wear as a busy mom of two. But as is its stylish, chic, easy to style and can be worn with fairly casual trousers while still maintaining a very put together look. I used this rayon challis from Raspberry Creek Fabrics but I think any of these rayons would be amazing too! Rayon is my favorite as it feels amazing and has incredible drape which is necessary for this top. You can use other fabrics as well but a fabric with less drape will add more body. The Sirocco Top and Dress is on sale now for $9.50 (regularly $12) and there is an added discount in the Coffee and Thread Facebook group so be sure to go join there first! Its such a great top for me to add to my collection of Hadley Tops and Cheyenne Tunics and I can't wait to see the ones you all sew up! What view will you be making first - top or dress? Yours is so pretty! Love the deep facings! Thanks! Deep facings get me every time! You look amazing! Love the top so much! 💙 Thank you so much for testing it out!